Just in time for Black Friday and Cyber Week, all the Atelier Mandaline shops are on sale! I've listed a ton of inventory for the week and more is on the way. 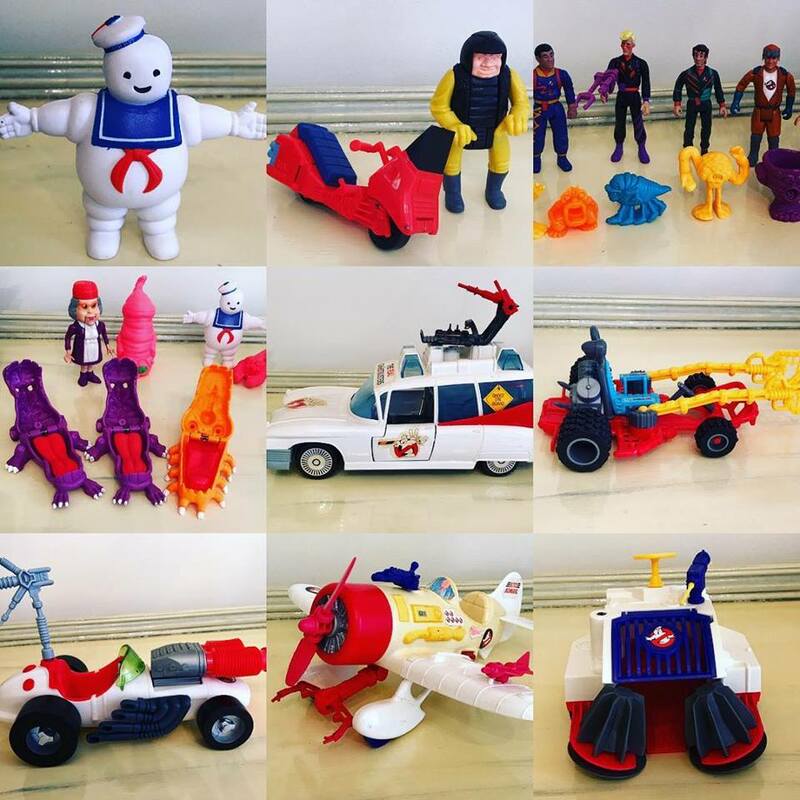 The eBay store is packed with vintage action figures and toys from the Ghostbusters collection by Kenner. These are selling fast, so if you collect these rare toys head to eBay today. Besides Ghostbusters, I have lots of vintage Mattel Barbie clothes and dolls for sale on eBay and Etsy either marked down or with low starting bids. The entire Etsy shop is on sale through December 1st. I have many doll restoration materials on sale and many dolls already restored. My Studio Mandaline Poshmark boutique is also discounted storewide through Sunday and I have a bunch of LulaRoe leggings and Carly dresses newly listed. Make an offer on Poshmark for pieces worn only once or twice or bid on pieces with a little more wear on eBay. Head to all my shops from the website to save! 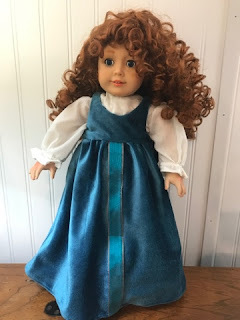 If you've been following the blog for a while you know I resisted learning to restore American Girl dolls. 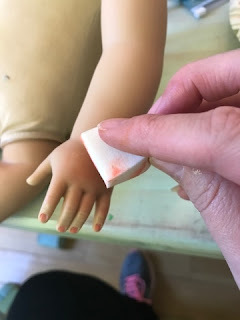 I don't have the same passion for them as the older dolls, and it seemed pointless to learn to fix them when there is an American Girl hospital for them. 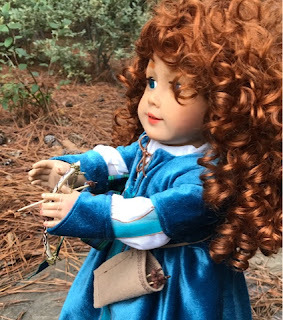 With older dolls you have no choice; you either have to learn to fix them or find someone to fix them or see if you can buy a replacement. 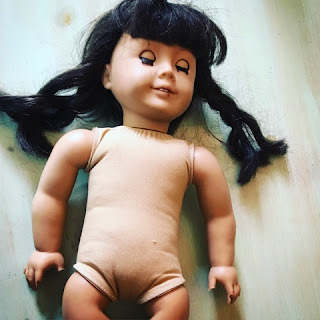 American Girl dolls are not cheap to restore, either. 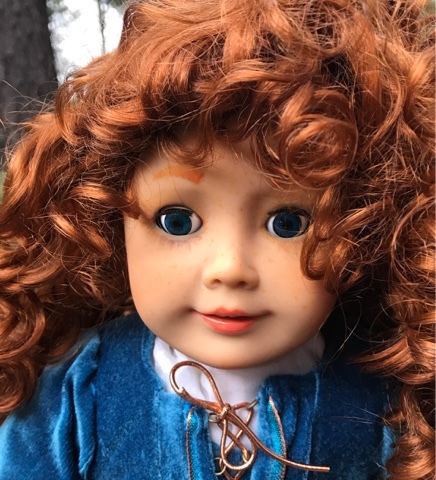 I hear rumors of people finding $20 dolls but my experience is you have to spend around $60 on the doll and supplies before you can restore her. That means you have to make a great profit on the doll or you're taking a loss. However, I was constantly bombarded with questions about restoring American Girl dolls, waking up every morning to tons of inquiries that came in to my eBay or Etsy shops or through my website or blog in the night. 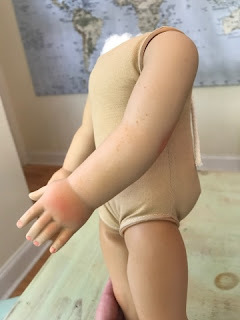 So I broke down and ordered one beleaguered Samantha who needed every kind of repair and I taught myself how to fix her. 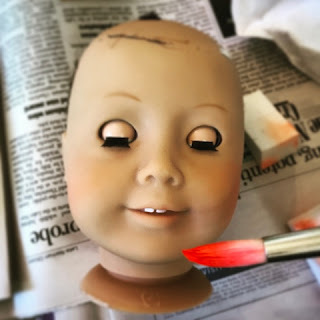 I used Samantha to learn to re-wig, replace eyes, re-paint, and replace limbs and re-string American Girl dolls. 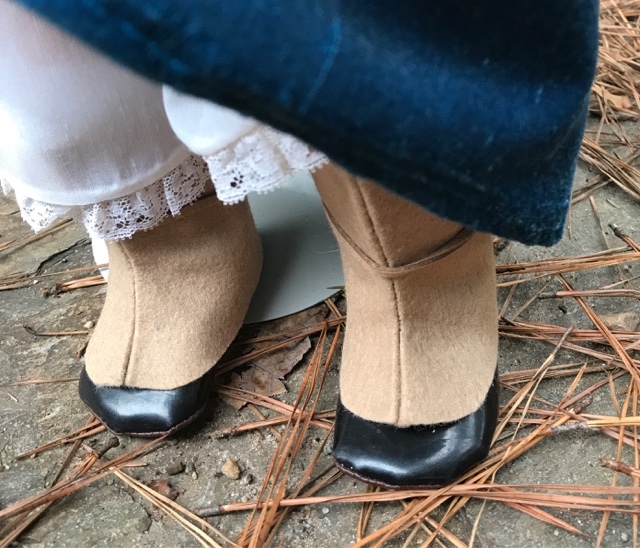 You can read over the past several posts for instructions on most of these and buy supplies from my eBay and Etsy shops (link through my website). 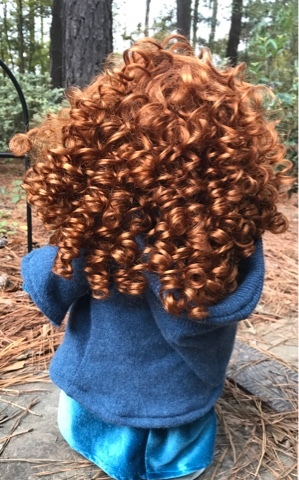 I found it's quite difficult to remove the American Girl wigs. I boiled the head and pried off the wig with a spoon. I don't understand why a doll company that uses wigs instead of rooted hair would make them so difficult to remove unless they are trying to force people to buy a whole new head from their doll hospital. Samantha's new identity was entirely determined by my stock of supplies. 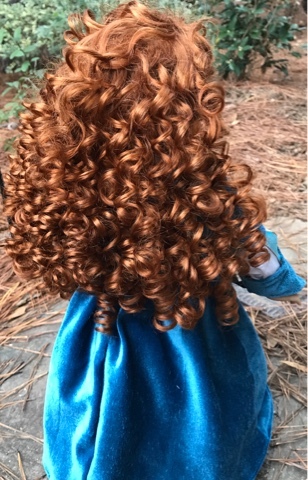 I had a red curly wig and handpainted electric blue eyes to fit her, so I decided she would use those to become Merida, the Celtic princess from the movie, Brave. I'm quite familiar with Merida because my daughter was obsessed with the movie when it came out. 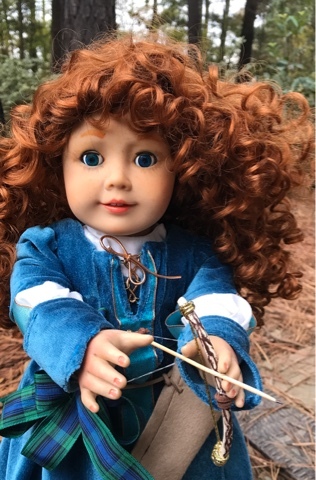 It's odd because my daughter is Chinese so you would think she would be all about Mulan, but something about Merida's independence and her archery skills really appealed to her. The limbs are also painted. Her face and arms have freckles. She has a tiny "scar". 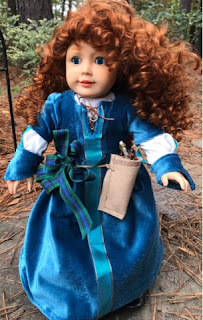 Merida got a whole-body re-paint. 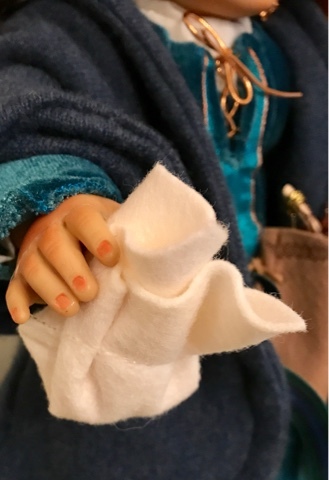 I emulated the great Madame Alexander and blushed her hands, knees, elbows, and earlobes to make the doll more realistic. Her finger and toenails are blushed and glossed to make them look real. Even her arms are freckled like her face! 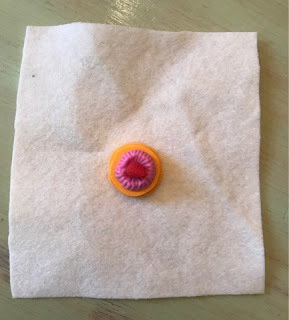 The cloth body had a tiny pinhole so I darned over it to fix it. Now I say Merida has a scar from an early archery accident! 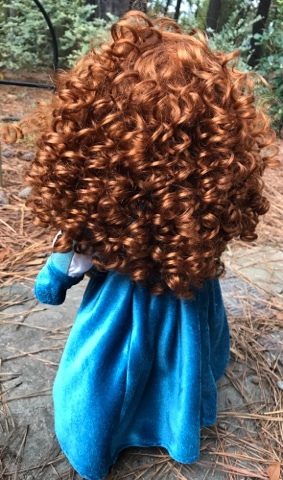 Merida's arms are replacements and her limbs are all re-strung. 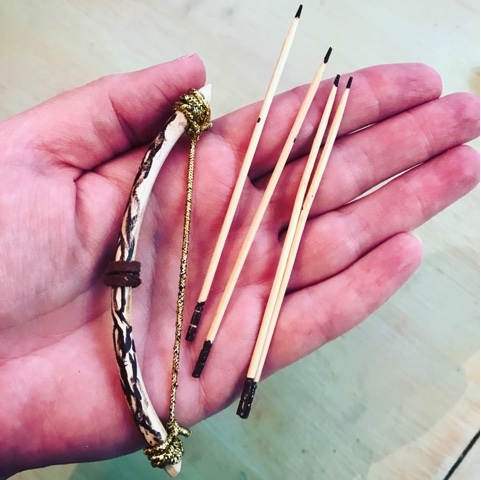 Merida's bow and arrow set. You can really shoot the arrows! 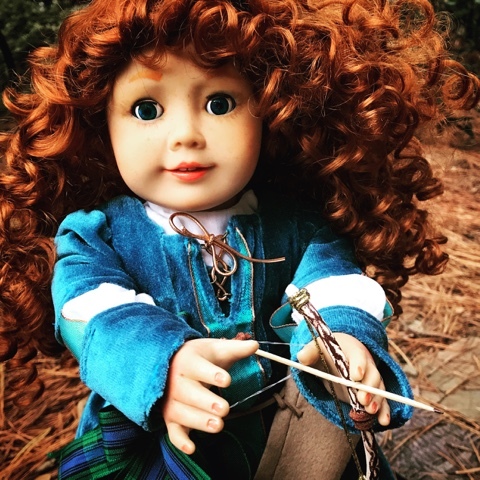 Merida's whole deal is that she is an archer, so she had to have a bow and arrow set. I made a bow from wood and elastic cord and made tiny arrows from bamboo. You can shoot the arrows, although my daughter is better at it than I. When I try it the arrows fly backwards! I never have been athletic, even on a small scale. My son is obsessed with the tiny bow and arrow set and I keep catching him messing with it. I think I will have to make him one for Christmas! The chemise can also be a nightgown. The jacket protects her arms. 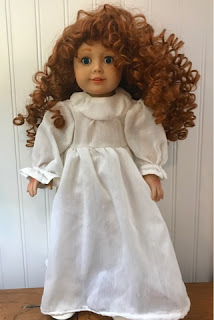 I have a bunch of vintage doll clothes patterns from the 1990s and I've been using them for years to draw my own patterns. I use the pieces for sizing and combine them in different ways and re-draw various parts so now I can pretty much create any kind of outfit I want. I made Merida a chemise and bloomers she would wear as a nightgown and under her clothes. Back when clothing was much harder to produce and launder it was not often washed. People wore layers of clothes so they only had to wash the dirtiest pieces, worn closest to their skin usually. I made a velour dress for Merida and then a jacket with gauntlet sleeves to wear over that. 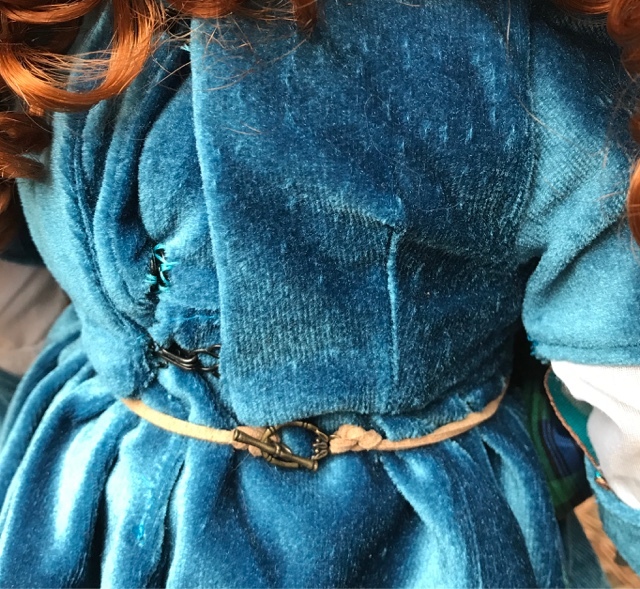 The jacket has split elbows to make it easier for Merida to shoot arrows. Merida's cloak has a shield closure. The trouble with me is once I get interested in something I literally can't think about anything else for a while. I just can't stop myself from working and working and expanding an idea. 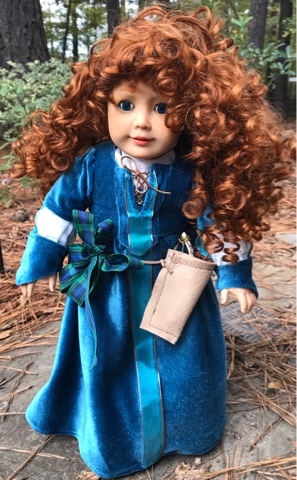 So, although I ought to have just stopped and listed this doll I just couldn't. I decided she needed a cloak. 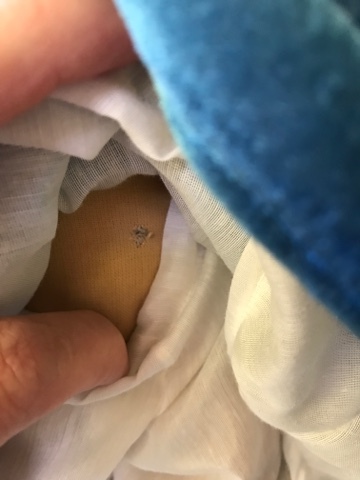 My husband's cashmere sweater got a hole in it (after he left it in the garage for ages) and look at that... it's a perfect match! So, Merida got a real cashmere hooded cloak. I found a vintage button with a heraldic shield to make the perfect closure. 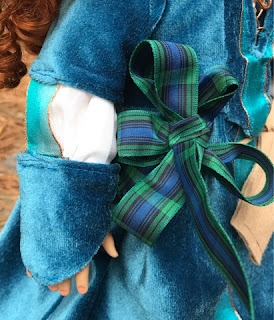 She has a belt with tartan rosette. The belt has a toggle clasp. 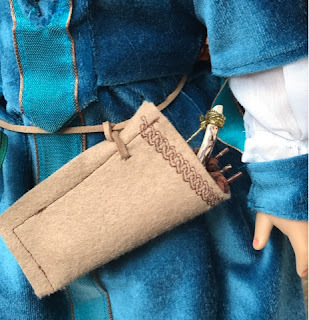 The quiver attaches to the belt. 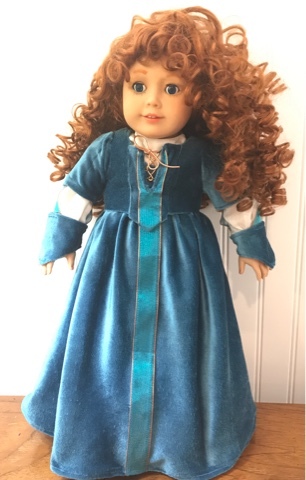 So, as usual, I got completely carried away and spent WAY too much time and money on this doll. I would have to charge $1000 to get paid for all the time I put into it. Luckily, I have her listed on Etsy for quite a bit less! 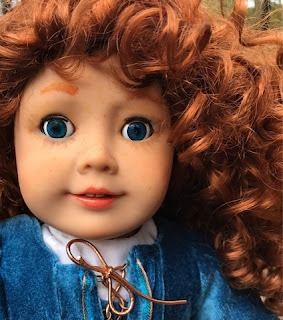 And because now I'm afraid I have become addicted to American Girl restorations, I have more on the way. Look for vintage Glorex dolls restored as Harry Potter and Hermione Granger coming soon, and for more American Girls restored as Elsa from Frozen and Mulan. 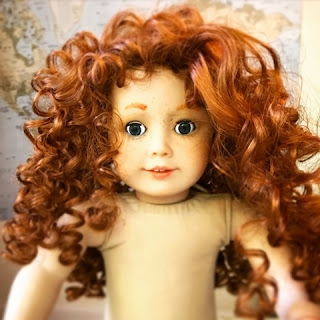 To see a Merida slide show, head to my website. This week brought some welcome news. A few years ago I bought Dr. Atkins' Vita-Nutrient Solution on eBay for about $5 after a long bout of respiratory illness. I became sick one year in about September and several months later, around Christmastime, after two courses of antibiotics I was still not well. I followed Dr. Atkins' recommended treatment course and started feeling better within just a couple days. Since then I've used the book to treat anything anyone comes down with. Most people are unaware Dr. Atkins was a cardiologist and complementary physician for 40 years. That means he always tried to treat illness with nutrition and herbs and supplements before or in conjunction with pharmaceuticals. He complied his proven treatments in this book and it really has a treatment for almost everything. Type 1 diabetes is no different. When my son was diagnosed I looked up the treatment and put him on the recommended diet and supplements. I found most packs of vitamins labeled as being for diabetics contain the same ingredients Atkins recommends. I also looked up new studies to see if any herbs had been used successfully. A recent study by a group of Asian doctors showed such promising results using stevia, flax seed, avocado seed, cinnamon bark, and herbs including dill, geranium, and cardamom they theorized it might be as effective as the stem cell therapy currently being studied. So I gave my son a jar of powdered homegrown stevia to take in his food and made him a roll-on using essential oils, flax seed oil, and avocado oil. He's been using all these nutritional therapies along with his prescribed insulin for around a month now. Two days ago when he went to his endocrinologist she was able to take him off his mealtime insulin! He is now only taking one shot at night, which, for a newly-diagnosed T1D, is almost unheard of! His blood glucose is still so low, in fact, we anticipate the doctor will step his insulin down even further! This result is exactly what Atkins describes in the book. He said as long as a patient had been diagnosed no longer than a year previously he was very often able to step down their insulin until they no longer needed it because his regimen re-activated their pancreas. It is supposed to be impossible for a Type 1 diabetic to get off insulin, but Atkins' patients were able to do so and my son is nearly there just from following the treatment, with the help of his doctors of course. It is imperative you do not try to follow the treatment for Type 1 Diabetes yourself without the help of your doctor. Following the program while taking insulin can result in fatal episodes of low blood sugar, so you must have your doctor review the treatment and monitor your blood glucose carefully. I am so thrilled with my son's results and pray he continues to improve! 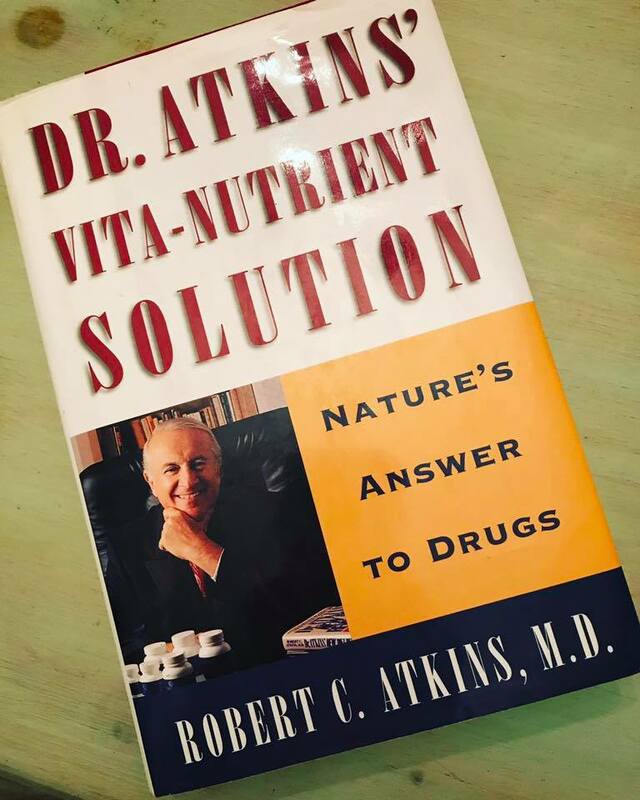 I am so thankful to Dr. Atkins for writing this book and to all the doctors currently studying nature's cures. It is so empowering to learn to use herbs and vitamins and nutrition to benefit your health and your family's health without any of the side effects of drugs. My recommended brand of essential oils and supplements is here. Unfortunately they don't make a diabetes formula, although you can contact me for advice about oil blends that support pancreatic health. I was able to find a couple different brands of diabetic vitamins in various drugstores and in Walmart with the diabetic supplies. I chose a blend that had Atkins' recommended ingredients and dosage as much as possible. No matter what your state of health, I truly feel you should read this book. It has been a literal lifesaver for us! For more recommended reading I suggest you head to my shops from the links on my website. 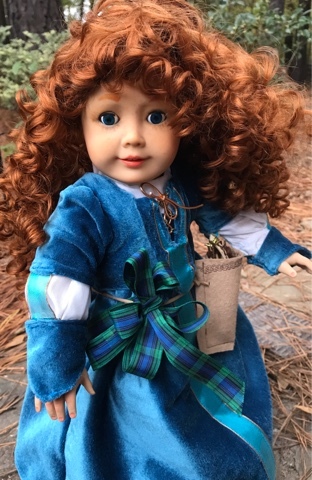 Through Monday I have everything on sale, including dolls, supplies, fashion, Jamberry nail wraps, vintage men's accessories, kids' clothes, and more! This is my small gesture to thank my husband and all other veterans for their unwavering bravery. Happy Veterans' Day! I'm always trying to keep my inventory and business model up-to-date. My shop has always been evolving. I opened my eBay account originally to sell my artwork. At the time I worked as a graphic designer and illustrator for a publishing company and also freelanced as a writer for local magazines and publications. When I was pregnant with my oldest son my husband was in a near-fatal work accident and became disabled. He was out of work for months on disability and I was trying anything I could think of to make extra cash. Artwork, as it turned out, didn't sell well on eBay but once I had children I realized kid's clothes did sell well. My daughter in particular had a fabulous wardrobe and I could often make a profit on clothes she'd worn and outgrown simply by combining pieces into really appealing outfits. That's when I was bitten by the design bug and started to think about creating my own fashions. 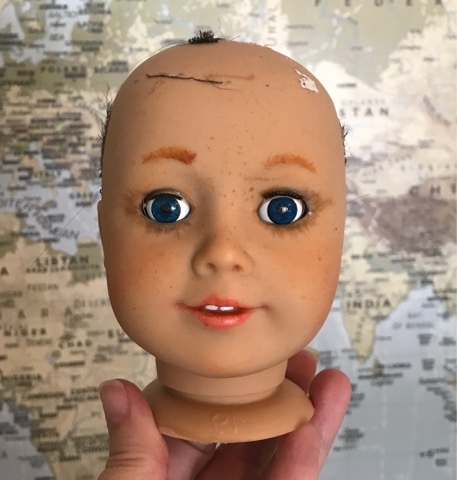 I found toys were popular, especially vintage toys and dolls. 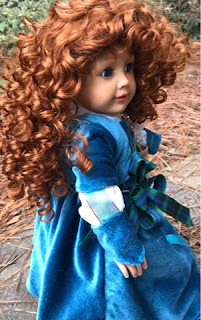 I began to explore doll making and restoration and started my Mandaline Artful Living blog. That's when my sales really took off and I began to have a presence as a brand. Five years ago I officially opened an eBay store called Atelier Mandaline. 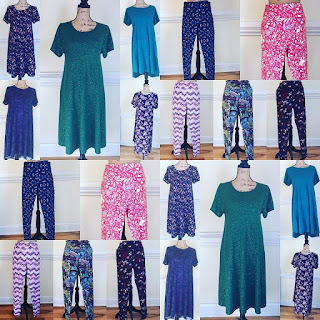 An Etsy store followed, then a Young Living distribution shop, then a Facebook shop and a Poshmark boutique, and now my website, which ties all the "Mandaline" stores together in one place. 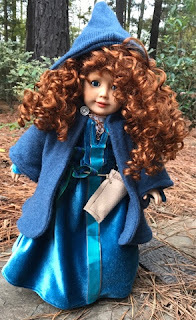 While dolls and doll supplies and kids' clothes are still my focus, I recently branched out into women's fashion. If you read my last post you know I have been trying really hard to allow a recent difficult life change to spark positive transformation for me. I've lost about 12 pounds in the past couple months and hope to lose a lot more. My wardrobe has been truly stagnant for years now. An embarrassing amount of the clothes in my closet are at least 10 years old and pretty much all my outfits are Mom-style sweatpants and leggings and ratty shirts or things my mother or sisters passed down to me that aren't my style or don't really fit. I decided to motivate myself by filling my Poshmark boutique with stylish new fashions to motivate me to stay on my diet. It's working, because I can already wear some of the new stuff and I'm sorely tempted to keep them for myself! 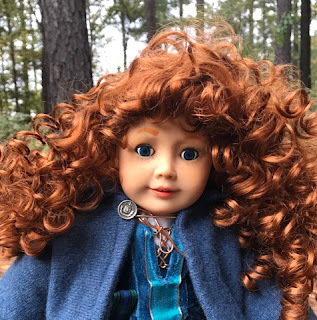 I selected the hottest trends for fall, according to eBay: leggings in tie dyed, tribal, Nordic, native, and floral prints, chunky poncho sweaters, and super-soft tunic tops. 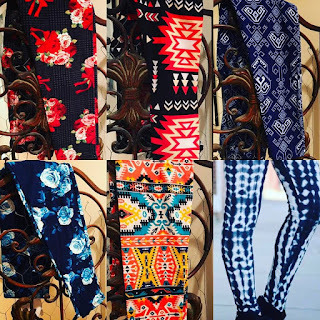 The leggings and ponchos are one size fits most and the tops come in size small through large. In most cases I have only one of each color or size. If you are new to Poshmark you can sign up with code STUDIOMANDALINE for a $5 credit. I'm trying a few pieces out on eBay too. I hope my fashion experiment has positive results, because I spent a hefty chunk of change on new inventory! I want to bring a new facet to my brand while keeping my traditional customers happy. I have to say, I absolutely love selling wholesale stuff! It's so easy and fun, and while I love designing and creating my own stuff, I really struggle to find the time to keep adequate inventory in the stores when I make or restore it myself. If the pieces in the boutique do well look for even more adult's fashions. You can link to all my shops from ateliermandaline.com. A little over a month ago (46 days to be exact) I told you of my plan to eat a ketogenic diet and test my blood sugar levels. My son was diagnosed with Type 1 diabetes and, like most people who don't know someone with the disease, I was totally unfamiliar with it. Type 1 diabetes isn't caused by the foods you eat or even much by heredity. Instead it is the result of something causing the pancreas to fail. Scientists have pinpointed two possible causes through study: a strain of enterovirus, an illness common during childhood, and global warming from climate change. Two therapies look promising: a vaccine for the strain of enterovirus and stem cell therapy to replace brown fat damaged by too much heat, but as of now there is no cure. Unless something changes my son will spend the rest of his life carefully calculating the carbohydrate content of his food and giving himself insulin. My husband and I decided to try to stick to a ketogenic diet so we could learn to cook food our son can eat and I went a step further and got some ketogenic test strips so I could understand his experience fully by testing myself every time I eat. I also ordered a copy of the original Atkins diet book, Dr. Atkins' Diet Revolution because I remembered Dr. Atkins saying his original diet was a treatment for diabetics he decided to try when he needed to lose weight. I tried the New Diet Revolution back in the early 2000s and I remember my mom saying how different it was from the original. Let me tell you, she wasn't lying! I remember thinking the New diet would turn you into an alcoholic because you were allowed to have so much wine and liquor but the original diet limits all alcohol, including sugar alcohol sweeteners. I really want to recommend reading the Diet Revolution book because I tried the ketogenic diet early this year following advice from the Internet. It was a dismal failure! Not only did I actually gain weight but I was sick the entire time. It seemed like I caught every germ that floated past me! I think the reason I failed is because the version of the diet, which recommended only drinking bulletproof coffee for breakfast as well as intermittent fasting, and which allowed wine, played into all my worst weaknesses. I would fast until about noon and then would have only coffee. After supper I would of course be ravenous and would eat and drink everything in sight, staying up late most nights. Then the next day I was exhausted. I was also lifting weights and exercising way too much for my caloric intake. Over-exercising has been a problem for me in the past. I have actually stopped my menstrual cycle before because of strict diet and heavy workouts and I think one reason I struggle with weight loss now is I damaged my metabolism so terribly in my youth. So, this time I am following the book and only walking the dog or working in the garden or other purpose-driven activities for exercise. Later on I may add working out back into the mix if I feel like I can control it. When we got our son's diagnosis I was the heaviest I've ever been despite having been on a diet for basically the past 18 years. Cast your memory back to every diet and exercise technique you've ever heard of... I guarantee you I've tried it! In fact, when he was diagnosed I was eating 90% vegan and still not really losing weight. I struggled constantly with fatigue as well. Reading the book I found out I probably react to alcohol as a carbohydrate and certainly have been struggling with what Atkins called "hypoglycemia" but which we would now refer to as unstable blood sugar. Almost all my adult life I have found myself hungrier at night than during the day. My typical pattern was to eat little to no food until supper. Then around 10PM I would experience intense cravings for wine and hunger pangs, to which I would usually succumb. Not eating or drinking after supper was a nearly Herculean task for me. Dr. Atkins taught me I was the victim of falling blood sugar at night, for which I was self-medicating with wine and typically cheese (I've never fit the pattern you usually think of with people who develop diabetes, those who crave sweets). I would then have a surge of insulin with increased energy and would find it very hard to fall asleep. In the morning I would wake up exhausted and not at all hungry. And the pattern would repeat itself in a vicious cycle! My mother and her entire family always exhibited the night-eating, night-owl mentality so I most likely inherited the tendency toward unstable blood sugar. Which isn't surprising if you consider that until we came to America just a century ago all we mostly had to eat were fish and dairy products! The first day of my diet I forced myself to eat a huge, fatty breakfast and was promptly and incredibly sick. I forged on, however, eating protein-rich foods with quality fats whenever I had a craving for something which wasn't on the diet. I also tested my blood sugar before and after every meal. As Dr. Atkins promised, my nighttime cravings for food and drink disappeared immediately. This is probably due to the sudden switch from the vegan to the ketogenic diet! I was so sick for the first week, Young Living's DiGize oil was my best friend! After that, however, I experienced a real difference in the way I felt. I rarely eat or drink at night now, and when I do it's because I want to and have the carbs and calories left to do so, not because I have some uncontrollable urge to eat. I found out Atkins wrote other books back in the 1970s: the Super Energy Diet and the Diet Revolution Cook Book, so I ordered those too. My first month's results were extremely disheartening. 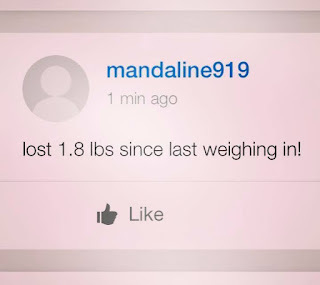 Despite following the diet religiously I lost only 3.2 pounds and only had one day when I experienced the surge of energy that the diet is supposed to give you. I lost the weight the first week and then for the whole rest of the month there was nothing; I even gained some weight back in the middle of the month. This is what has always happened when I try to lose weight, every single time! This time, however, I had the keto strips and I used them to understand what foods raise my blood sugar and shut down my weight loss. Breaded foods, like popcorn shrimp and clam strips, long favorites of mine, throw me out of ketosis even when I stay within my carbohydrate count for the day. Wine does not, unless I drink a ton of it, so at least that's some consolation for having to severely limit some of my absolute favorite foods. Using the keto strips I was able to get back on track and so far in November I have lost 3.6 pounds. I had already lost a little from stress during my son's initial diagnosis and hospital stay, so all together I am down 10 pounds. These are supposed to be for sale but I want them! I am so proud of myself. Since the beginning of September our son got diabetes, our dog died, our other dogs got terribly sick, we had a flood in two rooms on two different floors of our house, and our clothes dryer died. The dryer just died yesterday, so you can see our luck hasn't exactly improved! I'm kind of scared to wake up in the mornings! In the past I would have fallen right off my diet and schedule during all the stress. This time I have kept testing and stayed on my diet fairly well. Some days I have chosen to heat up clam strips for supper because we were busy, or something like that, but then I have immediately gotten right back on track and it's working! It isn't even very difficult. I rarely have cravings for anything, I guess because my blood sugar is stable. If I do I immediately eat some protein, just as the doctor suggests! 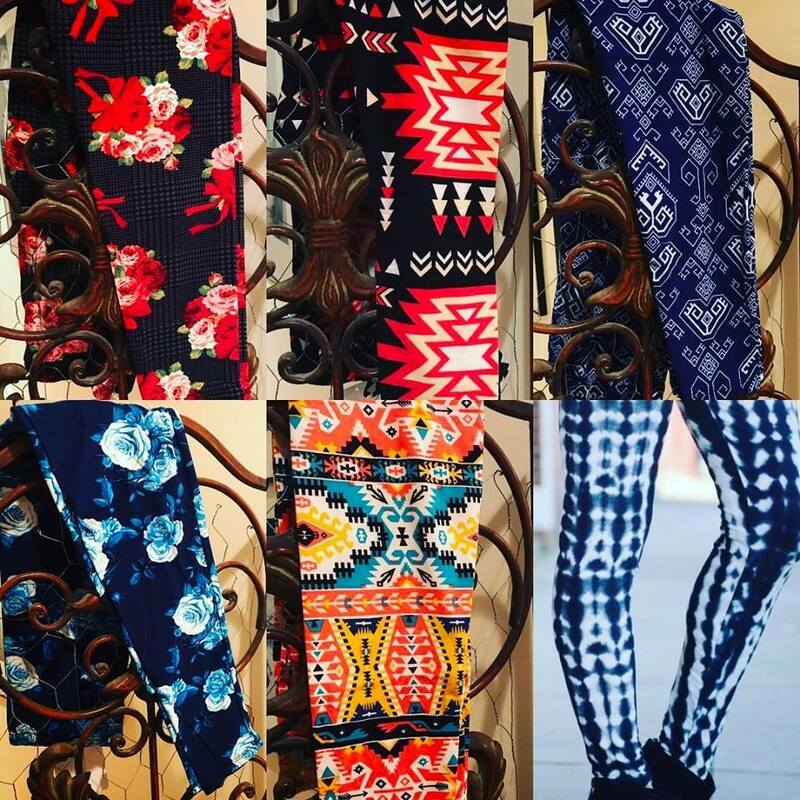 My Studio Mandaline closet on Poshmark is now a boutique and I just got my first shipment of wholesale fashion merchandise in stock. I purposely ordered clothes I knew were too small for me so I wouldn't be tempted to keep them, but guess what? They fit me now! So now I'm tempted, especially by the ensemble shown above! So if you see something you like on eBay or Poshmark you'd better grab it before it makes its way into my wardrobe! You can link from my website to those shops. From my website you can also order the Young Living products I find most helpful to staying on track: Slique Essence oil, 3 drops taken in water before meals, Slique CitraSlim capsules, and DiGize essential oil, taken in water whenever my stomach gets upset, which is still pretty frequent. I know I haven't even been on this diet for two months, and I've failed at so many diets, including newer versions of Atkins, so it's really hard for me to believe this time it might work. I wanted to share my experience so far, however, because I talk to women all the time who have the same issues as I and I want to encourage you. Read the book. 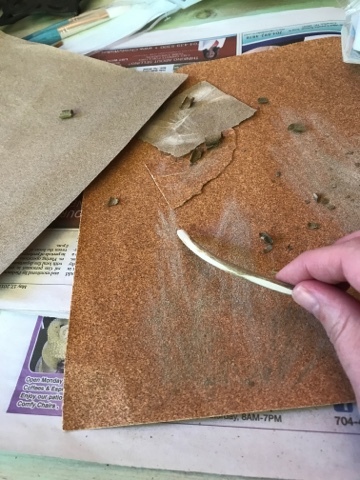 Use the test strips. Pay attention to your results. You might find some simple changes make a big difference! If you've made it all the way through this LONG post, I congratulate you and hope my experience helps you!